Henley Symphony Orchestra gave a Regatta concert at St Mary’s Church on Wednesday which, says their programme, is part of the London 2012 Cultural Olympiad. The HSO ranks among the best amateur orchestras in the country, and their rendition of Eric Coates’s ‘Oxford Street’, Elgar’s ‘Nimrod’ and ‘Pomp and Circumstance’, Vangelis’s ‘Chariots of Fire’ and Orlando Gough’s Olympic-commissioned overture ‘Traditional Values’ (that included a movement called ‘Brollie Bits’) was superb — even if parts of Gough’s work sounded like a muster in a bluster at the Barrier. The hymn sheet tells you where the Cultural Olympiad is coming from — the last night of the Proms. ‘Chariots of Fire’ is rousingly Olympic, OK, but this must be an opportunity missed for a concert within a bugle call of the 1908 and 1948 Olympic course. Where is Handel and his Water Musick? Where is the Willowing Sway of the Hands Away? Where is the music hall songs of the scullers of coaly Tyne? Where is ‘Row, Row your boat, Gently down the stream’? Where is the theme tune from ‘Bert and Dickie’? The programme at St Mary’s was extracted from the HSO’s concert at Shiplake College on the previous Sunday that also included Tchaikovsky’s 1812. Too bad they didn’t bring this to the church, because on the first day of the 1908 Olympic regatta the Russian composer’s glorious clash of canon and bells was played on the riverbank opposite Leander, where competitors were no doubt enjoying a libation. I expect the crew from St. Petersburg University would have enjoyed that . Pity the Cultural Olympiad seems to be concerned only with pomp while knowing nothing about circumstance. At 5.50 a.m. the sculler from El Salvador, Vargas Paloma, paddled gently downstream past the enclosure, her blue and white striped blades reflecting perfectly the striped façade of the boat tents. The lawn was dewy in perfect mown lanes. It was warm and still under wafting light grey clouds, tinged with the salmon of sunrise. This is the best moment of the first day of HRR, before the crowds arrive and the racing starts. Then a tractor drove onto the lawn hauling a trailer stacked with deckchairs, and the litter gatherers began to set them out. The first launch of the day slides towards the start with umpire Smallbone and chairman Sweeney standing behind the driver and noting anything out of order. A radio message comes in to commentator Blandford-Baker that the quarter mile signal has nobody manning it for the first race. ‘We’ll have to wing it.’ Recorders Cadbury and Jabale fiddle around with their timepieces and the pro-formas they will fill in to report the details of the first race of 2012 Henley — a heat of the Thames Cup between Greenwich’s Curlew Rowing Club A crew and, Sod’s Law of the Draw, Curlew Rowing Club B crew. Sweeney is suspicious that he has seen no Canada geese. A little further on, a meadow comes into view that is a mass of Canadian geese. They are being watched by the crew of a small catamaran armed with sliced loafs. The traffic lights telling the umpire that the course is clear are not working. Precisely at 8.30 am, Smallbone begins the starting ritual for the two Curlews, having requested, firmly, an Eton crew to back off from the downstream end of the start pontoon. The Eton shell is named Constantine Louloudis after the injured stroke of the GB national eight. A lone figure in the little stand overlooking the start is Charlie Wiggin, commentator for Regatta Radio. Are you ready, Go! says Smallbone, and off they set. The ‘A’ crew on Bucks streaks away and soon builds a commanding lead. There is one occupied boat moored on the booms opposite the enclosures. The occupant is the likely lad Rodney Bewes, London RC’s most regular supporter, and he waves to the first umpire’s launch of the day. There is a new results board in the style of a cricket scoreboard. Gone are the ropes that operated it like a dumb waiter, replaced by hinged doors displaying lengths and time like a conjurer’s magic box. The operatives have not mastered the hinges yet, and some confusion reigns. 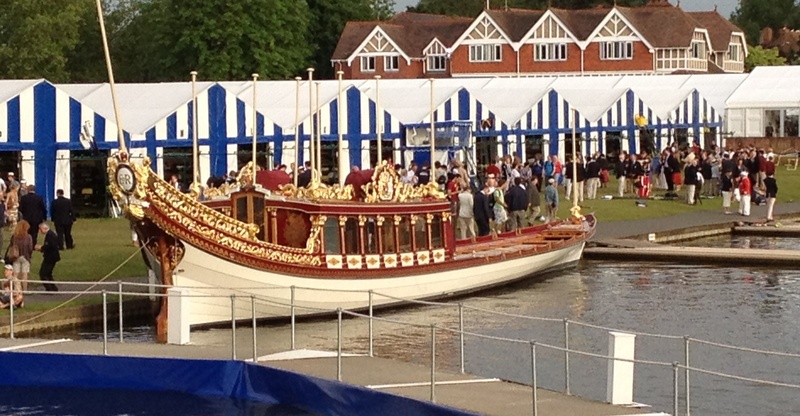 One thing that’s different this year is the over-gilt presence of Gloriana, a million quid’s worth of a gilded 18-oar barge, a replica of a seventeenth century stretch limo that will get an outing in the lunch break on Sunday. Rumour has it that Mark Edward’s magnificent vessel has twin engines fitted to supplement oars. Were they engaged when Gloriana led the Diamond Jubilee pageant on the Thames? Steward Topolski is wearing a new hat this year as he supervises activity round the boat tents. On Tuesday he was awarded the British Association of Rowing Journalists’ Journalist of the Year award for his commentaries on the BBC. The men’s eight final was a bummer unless you are Polish or Australian. It demonstrated that handing out medals on a plate confounds the Brits. The present here was the absence of the German eight that Britain has been edging closer to with each race of the season. Absent also were the Canadians, Dutch and recently qualified Americans who, on the lack-lustre showing of GB in Munich, will all thump them at Dorney. The Aussies arrived in Europe for Lucerne regatta three weeks ago and disappointed themselves, but they’ve sure gotten over the jetlag now. The Poles, however, stole a march on them by taking the lead in the second quarter and keeping it for gold. Ukraine brought up the rear behind the British crew’s bronze. Only four entries — bad show. I caught one remark by Greg Searle just before the medal ceremony. ‘Shame not to have Stan,’ he said, referring to the continued absence of Constantine Louloudis in the stroke seat. ‘We think he’ll fit in and give us what we need.’ It would be unfair to infer from this that all hope rests in Louloudis’s entry on the scene, only five weeks before the games. Searle’s quote should not be taken out of the context of his other remarks to which I was not privy. But one must hope that the crew’s has more powder in the magazine. Gold Poland, silver Australia, bronze Great Britain; UKR. We’ve been missing Ekaterina Karsten during the last two regattas. But the 40-year-old grand dame of sculling was back, and back with a vengeance, using her traditional race format to win her 38th senior gold and 29th world cup final of her career. The race leader was, rather dramatically, Fie Udby Erichsen from Denmark, a startling new addition to the top table from the Lucerne qualification regatta. Karsten wasn’t going to let her get away, though, and though sculling a bit more gingerly than before her recent rib injury, leant on the Dane from 800m to go, and soon romped into an unassailable lead. As Erichsen dropped like a lead balloon, New Zealand’s Emma Twigg took advantage of a lot of other missing scullers to claim silver. There are so many quality oarswomen to come into this event that it was a shadow of its true self, but now the hunt is on: can Karsten celebrate 20 years since her first Olympic medal with another one at her sixth Games? Gold Ekaterina Karsten (BLR), silver Emma Twigg (NZL), bronze Donata Vistartaite (LTU); DEN, AZE, IRL. The details vary, but the men’s singles script outline has looked set in stone for the last few years. Once Mahe Drysdale had declared himself unable to race after damaging his shoulder in a bike accident, and Ondrej Synek found better things to do, there was no doubt that Alan Campbell should have been a shoe-in for the gold in their absence, let alone those of the scullers from Cuba, China and Lithuania. Yet making the British champion think again was Marcel Hacker, bursting into an early lead and then driving home to the cheers of the local crowd for the most significant win for three whole years. Winning the German singles trial less than a fortnight before had been a great boost to Hacker, who may be on his way out of a rowing career but is clearly keen to finish in style. Behind him things got rather confusing as Mexican Patrick Loliger Salas held onto Hacker’s stern for as long as possible before fading, sapping Campbell’s confidence and opening the door for Swede Lassi Karonen to push into the silver-medal position ahead of the Briton. The highly encouraging part for Britain was Graeme Thomas making the most of a difficult race for others including Olaf Tufte, to claim fourth place a couple of lengths behind Campbell. Gold Marcel Hacker (GER), silver Lassi Karonen (SWE), bronze Alan Campbell (GBR); GBR2, MEX1, NOR. The view from the woman in Britain’s seat 6 was that instead of going out hard and keeping out of trouble, ‘we got dumped off the start and got into trouble, and then had to get out of trouble.’ Annie Vernon has changed from sculling to sweep to join this line-up that has been together now for two weeks. Al Morrow’s Canadians led the race all the way, with Roumania in pursuit. The Brits managed to turn on a great push in the last 500 metres, overtaking Netherlands and Australia to win the bronze medal. Gold Canada, silver Roumania, bronze Great Britain; NED, AUS, GER. Russia RSVP’d ‘no’ to the Munich invitation, letting Croatia have it all their own way. The Croats’ Filippi bow put itself ahead after 50m of the race and never slipped back, leaving Germany and Italy striving for silver and the rest for the last three places. Estonia’s sprinting capability, the product of Allar Raja and Kaspar Taimsoo’s time in the double, never showed to advantage, and the delighted Australians and Brits, in the A-final for the first time this season, got within overlap of the minor medals. “A big step on — haven’t stroked since 1997!” tweeted Britain’s Matt Wells. A couple of seconds more speed, and a medal might be within reach of hope for the Olympics for his crew as well as several others, even if the gold will probably be a face-off between Croatia and Russia unless someone pulls an AUS and jumps a level. It’s going to come down to which of the rest can meld their crew best into a single unit, and who can train hardest. Gold Croatia, silver Germany, bronze Italy; GBR, AUS, EST. There is no doubt that Ukraine’s women’s quad are head and shoulders above anyone else this year. Even Germany’s attempt to get on terms by putting Britta Oppelt and Annekatrin Thiele back into the big boat didn’t dent Ukraine’s confidence in the first straight final of the day. The blue and yellow blades sat second to Australia for several hundred metres in the Munich final, then just steadily leaned into the stroke and stamped on, moving steadily ahead at 33 strokes a minute. There was no response to this power, and Germany and Australia found themselves bowball to bowball as Ukraine swept ahead. Suddenly, charging up the field, came the GB quad. For the first time in the season the British crew, now stroked by two-times Olympic silver medallist Debbie Flood, found its top gear just in time to seize bronze. Though there wasn’t quite the technique the Brits have found in previous year — it could have been silver had there not been difficulties getting away from the bow side buoys in the final hundred metres. Look out for strong improvements from the Aussies and Brits over the weeks before the Olympics, and the Americans will be back to join the party too. The German quad could improve fast now that it has been settled. But everyone’s got a lot to do to catch up with Ukraine. Gold Ukraine, silver Germany, bronze Great Britain; AUS, NZL. This event produced a fabulous final with changes of order by the minute and a classically judged race by the Brits, restored to their selected line-up with Peter Chambers back in the bow seat. The Danish Olympic champions led to the first marker, only to be overhauled by the suicidal charge of the Swiss who led at halfway. The British four stole through to lead at the 1500 marker and extended their commanding view to cross the line two seconds ahead of the Aussie world champions who had followed the Brits through from the back of the field. The Danes snatched the bronze from the French, who were perhaps slightly put off by an earlier false start. The Chinese, winners at the Lucerne world cup, were not here. Gold Great Britain, silver Australia, bronze Denmark; FRA, SUI, CZE. The lightweight men’s doubles was a treat, fast and furious from the start. Whatever was up with GBR’s champion duo of Zac Purchase and Mark Hunter in Lucerne, it hasn’t yet been fixed. All OK in the semi-final, the lack of energy dropped them into sixth again in the final. So wipe them out of the list for now, which still leaves a clutch of half a dozen — France, New Zealand, Denmark, Hungary, Italy and the absent Canada — in the running for Olympic medals. After France’s gold in Lucerne, New Zealand 2009 champions Peter Taylor and Storm Uru turned the tables on their European rivals in Munich, levelled them on points and claimed the world cup victory through seizing an early advantage and then fending off charges from pretty well everyone else. Italy and France took their turns at pushing, but nobody could make any impression on the Kiwis and France’s sprint kept them ahead of fast-closing Denmark who used their wickedly fast final 500m to grab bronze. Britain came last after being unable to match Hungary’s Zsolt Hirling and Tamas Varga, whom they have beaten repeatedly on past occasions. But they’ll have to hurry up. Whether GB get their mojo back or not, there are still plenty of high-class crews challenging for any of the medals in this event. Gold New Zealand, silver France, bronze Denmark; ITA, HUN, GBR.